"The world and all that is in it expresses reality. Every therapy session, each moment in your life, is a koan to be solved, an opportunity to learn about your deeper being. How you respond is your choice. You always have the option to respond with your most enlightened nature." 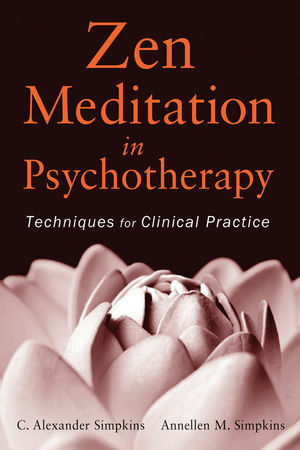 Grounded in both neuroscientific and clinical evidence that supports the use of Zen meditation to improve clients' mental health, this inspiring "how-to" guide encourages creative use of its techniques to suit your personal therapeutic style as well as your clients' needs. Zen Meditation in Psychotherapy provides you with methods that can be seamlessly integrated into ongoing treatments for a broad range of psychological problems, as well as with ways to enhance your own life, both professionally and personally. Filled with vivid case examples and writings from traditional texts, modern interpretations, meditation research, and illustrative legends, Zen Meditation in Psychotherapy encourages a therapeutic process in which clients move their attention from outside concerns to inner mindfulness. With a range of techniques that embrace the diversity and uniqueness of clients, this book offers methods and tools for seeing feelings and problems directly and objectively, which can lead to a profound shift in perspective. C. Alexander Simpkins, PhD, and Annellen M. Simpkins, PhD, have extensive training in psychotherapy, meditation, yoga, and Zen. They have clinical, teaching, and research experience using meditation either as the primary method or in conjunction with other forms of therapy. They have written several books on meditation, yoga, psychotherapy, and hypnosis, as well as books on several eastern philosophical traditions. Part II What Is Zen?